California bighorn sheep (Ovis canadensis sierrae) inhabit the southwest interior of British Columbia and extend southward on the east side of the Coast and Cascade Mountains into northern California. Normally a dark stripe extends from the dorsal area of the sheep through the white rump patch to connect with the dark tail. The horns of a California bighorn have more of an outward flare than those of the Rocky Mountain bighorn. California bighorn sheep can be found in alpine meadows, grassy mountain slopes and foothill areas near rugged, rocky cliffs and bluffs. 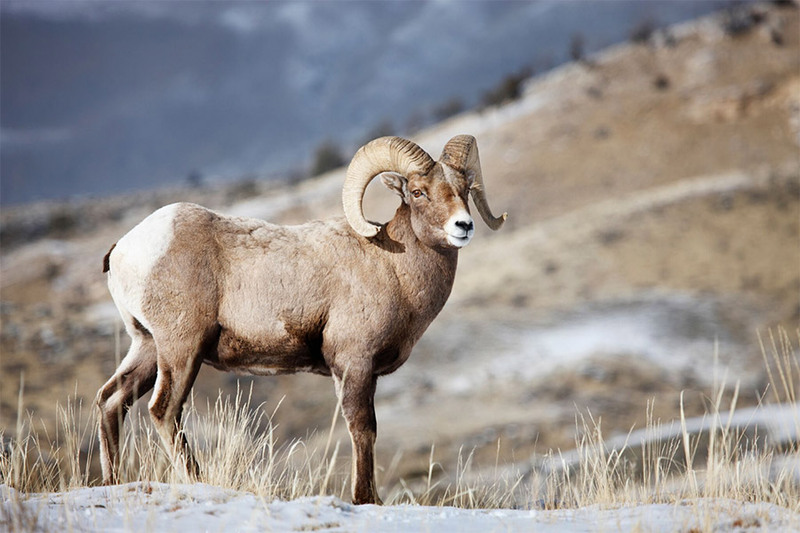 Generally, bighorn sheep have distinct seasonal ranges, though most of the year is spent on the winter range at lower elevations. Their skulls are double layered and have struts of bone for battle protection. The sheep also have a massive tendon linking the skull and spine to help the head pivot and recoil from blows. The horns are never shed and grow throughout a sheep’s life. Because they produce a prominent line, or annulus, each winter when growth slows, the horn is useful in telling a sheep’s age.